Pretty lavendar butterflies surround a yellow spirelli flower. 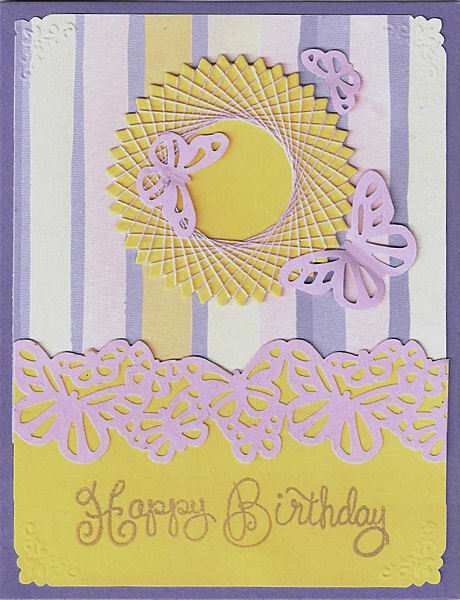 To make this card, punch a butterfly border from lavendar paper. Glue the border to a piece of 4" x 2 1/4" yellow card stock. Trim the the card stock along the tops of the butterflies. Stamp and emboss a greeting below the butterfly border. Cut a piece of pastel striped scrapbook paper to 4" x 5 1/4". Glue the scrapbook paper to the purple card blank and then add the yellow card stock with purple butterflies. Cut a pinked circle from yellow card stock using the Nestabilities 2 1/4" pinked circle. Wrap with lavendar embroidery floss (skip 13 spaces). Add the pinked circle to the card. Punch another section of the butterfly border from the lavendar paper and cut them apart into separate butterflies. Arrange the butterflies around the pinked circle as desired. Only glue the bodies to the card. Fold the wings up for a 3-d effect.